CHEBACHE - Strategic Board Game Uniting Checkers, Backgammon, Chess and More! Click to join! The Chebache egroups list provides discussion forum with other Chebache fans around the world. Strategy Board Game Unites The Ancients! Buyer's Guide for the Year 2000! math skills and inspiring more complex thinking! "...it's terrific fun, even exciting to play. ...I strongly recommend Chebache. I love this elegant game and I think you will too." movement choices are plenty and the flow of the game is ever-changing. ...this is a great, challenging and fun game. It takes elements of the classics to a whole new level." Please visit our Reviews page for more. 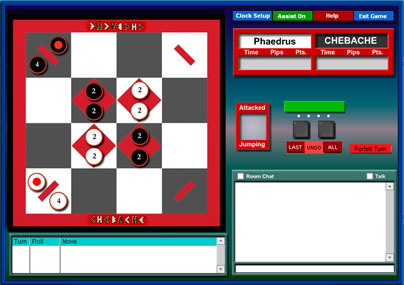 Play Chebache Online at HIGHERGAMES! You may also download an offline version and practice against yourself. Kirk and Andy hard at play, teaching Chebache game strategy. 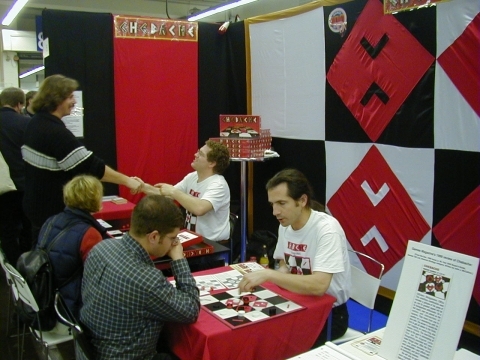 Gallery of photos - Game Fairs, Trade Shows, etc. Contact Us! Ask questions, offer your comments! Chebache ® is a registered trademark of Pardee Games. This website & all contents Copyright © 1997-2014 Pardee Games. All rights reserved. Chebache is protected by U.S. Patent #'s 5,791,650; 6,062,562; D384,376. The Games 100 Logo is used courtesy of Games Magazine.